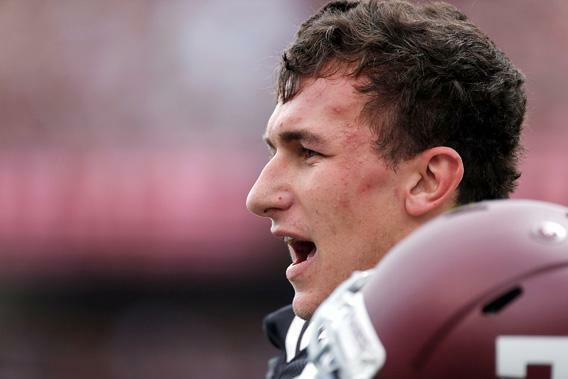 Johnny Manziel and the NCAA’s prison economy. Why Johnny Manziel would sell his autograph. Texas A&M quarterback Johnny Manziel waits on the sideline after a touchdown during the spring football game on April 13, 2013, in College Station, Texas. College football is a lot like prison. It can be relentlessly violent. You need permission from an authority figure to do anything. Everyone eats together in a cafeteria, wears uniforms, and lifts weights all the time. And since nobody’s got any cash, you need to extract value from whatever you can get your hands on. In prison, the economy used to run on cigarettes; now, inmates trade mackerel and postage stamps. In college sports, an athlete can peddle his jersey, his complimentary game tickets, and—in the case of Texas A&M quarterback Johnny Manziel—allegedly his signature. What Davis and others don’t seem to understand is that money is the only thing that’s money. Google employees get a free shuttle to the office, free food in the cafeteria, a free on-site gym, and free continuing education classes. They also get salaries, because paying people in perks is illegal for every employer except the NCAA. There’s a long tradition of college athletes, in defiance of NCAA rules, exchanging their work gear and other freebies for the money they’re denied. In 2003, a couple of LSU players were benched for selling their complimentary Sugar Bowl tickets. Three years ago, Georgia star A.J. Green had to sit out four games for selling his Independence Bowl jersey for $1,000. And a slew of guys from Ohio State, including quarterback Terrelle Pryor, were suspended for trading jerseys, championship rings, and other football paraphernalia for tattoos and cash. Everybody’s making money off Johnny Manziel except Johnny Manziel. Unless, that is, the allegations are true and the quarterback was paid by brokers to sign a whole bunch of sports memorabilia. As opposed to, say the Kerrville Daily Times, which cashes in on the local hero in a fairly straightforward fashion, Manziel has been forced—again, allegedly—to make money off his own name in a rather baroque way. The Heisman winner reportedly exchanged a commodity he had in abundance—his signatures—for something he actually wanted: sweet, sweet cash. Now, Manziel must wait and see if the NCAA casts him out of college football forever for having napalmed his amateur status. The quarterback is now represented by a lawyer who wears a cowboy hat, which leads me to assume he’ll be on the field for the Aggies’ season opener—as far as I know, a lawyer in a cowboy hat has never lost a case. Even so, Manziel wouldn’t have to go through this whole did-he-or-didn’t-he charade if the NFL allowed players to turn pro before they were three years out of high school. And so this Heisman-winning college sophomore is in football purgatory. He’s one of the most talented, most marketable athletes in America, and if he makes any money off of his talent, then he’s going to get benched. That sounds a lot like prison to me.